Aek Sijornih waterfall is two mini waterfalls with steps that located in Aek Libung village, Sayur Matinggi sub-district, South Tapanuli regency, North Sumatra. In contrast to common waterfalls that have slender and upright high, these waterfalls are located on the terrain slop / tilt on the ground with limestone content. The water spilled widely to the left and right, and epically look like water staring. The word Aek Sijornih means clear water, and it explaining the condition during rainy or dry season, the waterfall will always clear. 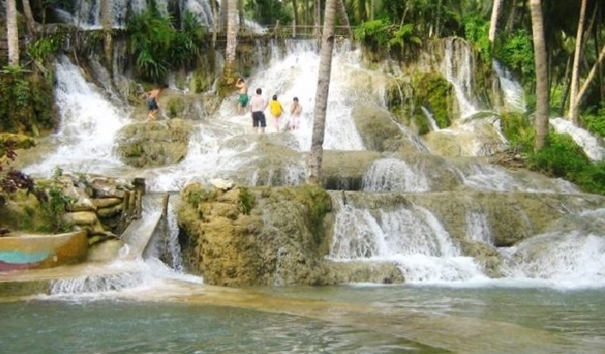 This waterfall has 10 m high and it surrounded by palm trees that grow around the waterfall. Located around + 35 km east of Padang Sidempuan, for about 2 hours’ drive or 380 km, it takes about 12 hours to reach this waterfall from Medan. We reach this location by private vehicle or public transportation like mini buses. Aside from Medan, it can also be accessed from Padang and Pekanbaru with the same travel time from Medan.